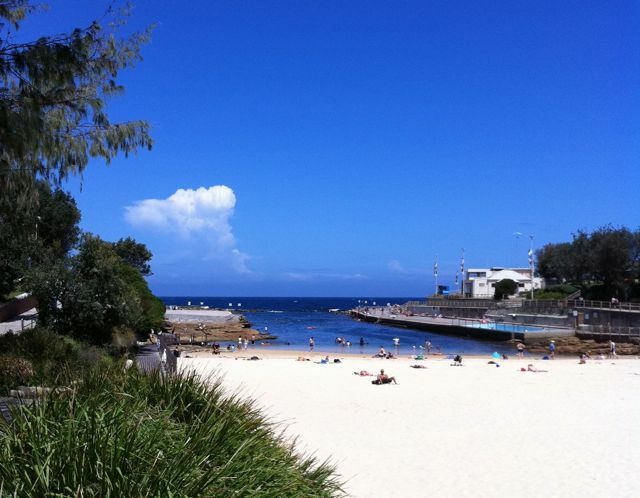 Summer in Sydney – and a girl’s breakfast! I missed some of the recent wild weather at home because I was down in Sydney visiting my daughter and little grandson, Taj, who is now one, and Bondi was definitely the spot for us all on such a beautiful summer’s day. A legacy of my life spent mostly outdoors is that in 2004 I was diagnosed with melanoma and spent an anxious year of surgery and treatment. Consequently, I get regular check-ups with my specialist in Sydney and am happy and relieved, once again, that it does not seem to have returned. But, it is also a golden opportunity to re-visit some of the places that I love and made Sydney a happy home for me and my family for 35 years. (Yes, I always wear a hat and am covered up). Bondi Beach (after the cyclone) – Karen and Sue braving the huge seas. 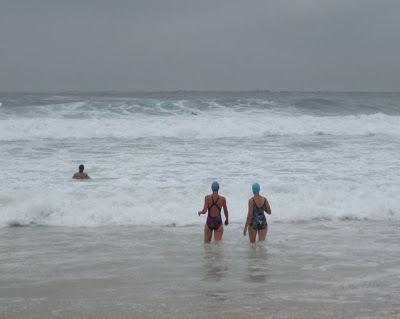 One of the things I always try to do is catch up with my ‘Tuesday Morning Girls’ at Bondi Beach who have been pounding the beach, ploughing through the surf and then having a coffee at Billie’s (Wave Cafe) every Tuesday morning for a very long time. Karen, Heather, Rose, Gillian, Sue and Helen – some of their friendships go back to childhood over 40 years ago – I’m a recent ring-in of only about 10 years standing. 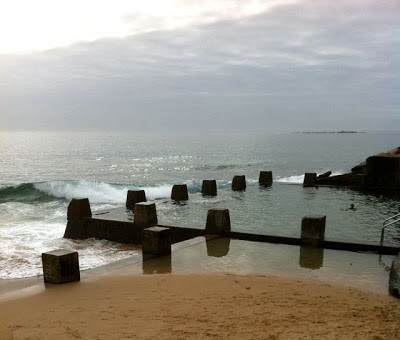 They walk (and talk) the beach, winter and summer, then have a swim, whatever the weather (often getting incredulous looks from bemused tourists) – it’s just such a fantastic way to start the day and it’s one thing I do miss since I moved away. My daughter lives in a great location close to lots of my favourite places to swim and I never go anywhere without my swimmers in my backpack. A swim always makes me feel better and its great exercise, even when – or should I say especially, when the body is aching or spirits sluggish. The great thing about Sydney is that there is always somewhere to get in the water no matter what the tide or wind direction. 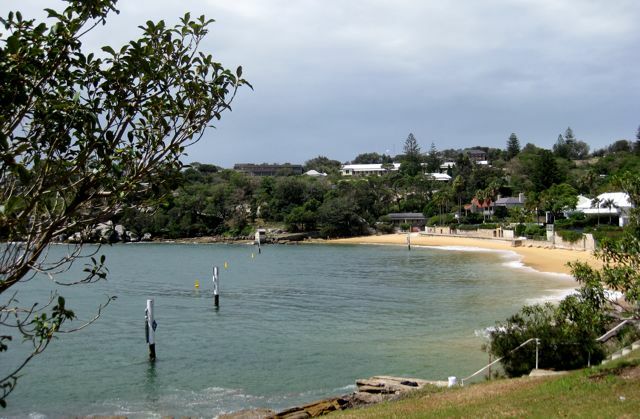 If a southerly buster is blowing you can go to one of the fabulous protected harbour beaches – like Camp Cove at Watson’s Bay. Perched inside the southerly tip of the Harbour entrance it was named by Captain Arthur Phillip of the First Fleet – because that’s where the British fleet first camped in 1788 after their long voyage from England. Ironically, it was because of it’s first inhabitants – the local indigenous peoples from the Cadigal tribe that it stuck out to Captain Phillip – the headland from where this photo was taken is called Green Point. And it is very green, and it does stick out because, for centuries, local aboriginal people have been using this spot to feast on the bountiful seafood from the harbour and it’s rocky foreshores – those shells and bones, from left-over lunches, have added increased lime to the sandy soil and consequently made it very green. This is known as a midden and are scattered all around the Australian coastline wherever it’s first peoples gathered to eat – most are much smaller than Green Point – but you don’t have to dig very far to find their legacy – lots and lots of shells. And now for a big secret. 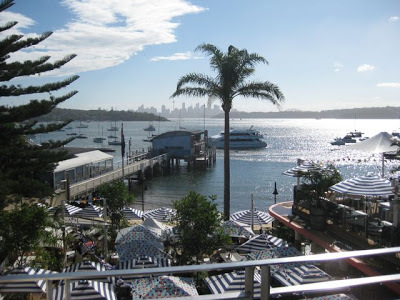 One of the best hotels I have ever stayed in is the Watson’s Bay Boutique Hotel and, because I couldn’t get home due to Cyclone Oswald, I went there for a two day return visit at the end of this trip. Pure luxury, peace and relaxation with a great buffet breakfast overlooking the Harbour. Just don’t tell anyone! 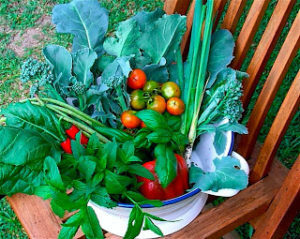 In 2005 we had sold our business in Sydney and we took a big trip to the UK, France, Greece and Turkey. I worked out that we had stayed in 32 different rooms in five months – everything from basic pensions to a couple of the top Boutique Hotels of the World. When we finally got back to Sydney we had booked in at Watson’s Bay before we flew home. My husband and I just looked at each other and said the same thing – in the whole of our trip, this was the best hotel that we had stayed in. Ex-Lounge breakfast, Bronte Beach. 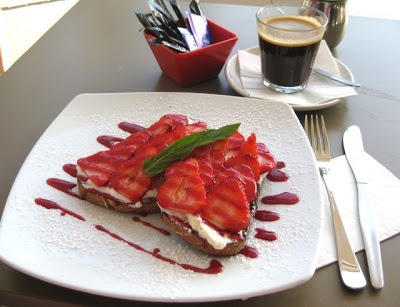 Strawberry bruschetta with fresh ricotta, fresh strawberries and berry coulis on toasted rye bread – yum, yum. Merci Marcel.